Everyone who has one loves them. I don't know how I got by without my milwaukee. Did you buy the Milsquawky "dedicated" cold cut, or just put a carbide blade in your go-roundy saw? I got the milwaukee 8" dry cut. It was $289 a couple years ago. The thickest I've cut is 1" and it goes a little slow on that, but anything under 5/8" is like cutting plywood. I have been skeptical of these since I first saw one four years ago. What a nasty mess it could be if it fed back...? Or maybe I'm just being too paranoid? We use to use a Skill worm drive saw and carbide pirana blade like 27 teeth or something a can of WD 40 some hearing protection and cut aluminum plate with it like 1 1/2" plate. Don't under estimate the power of a good saw and a properly designed blade. It's tuff to kill a good worm drive. Thats for sure! how much are the blades and can they be sent off to re-sharpen? My blades are around 40 or 50 bucks, can't remember exactly. I had Lenox and now I have the Morse Metal Devil and all three have warning not to have them resharpened. That could be because they would rather sell a new blade or liability concerns. I resharpened the Lenox myself on a 8" grinder and it did pretty good. I only used it to get me through until my new blades arrived though. To all who contribute to this board. My sincere thanks , Pete. About how long do they last? 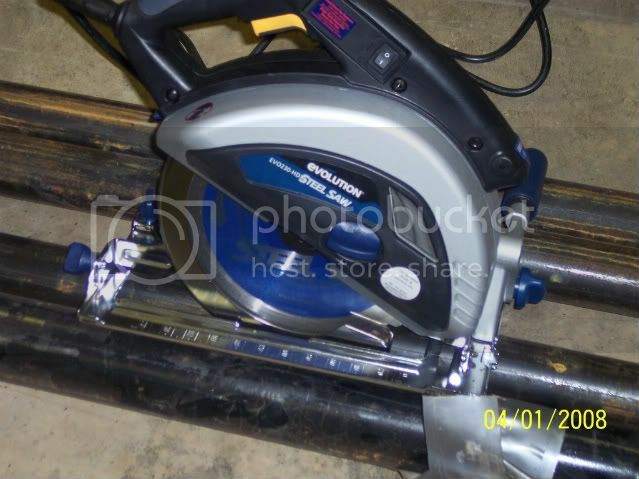 Is that a pipe track or cutting guide in your first picture? If so, do you have more pics and detail? Otherwise, does anyone have a cutting guide for extra-long cuts (other than just clamping a piece of angle or channel)? I got a Milwaukee 8" about 2 years ago and love it! It's great for cutting bar grate as well. I have had a couple of 8" blades sharpened, but I don't think it's worth it. I used one of those to cut AL and I was disapointed. It sucked because the main part the saw slides on across the metal kept digging in and would not slide across it smoothly. I did try it on MS and it worked very well. The milwaukee's baseplate is stainless and very smooth. I haven't used it on AL yet though. You can tape or clamp a strip of Formica to any metals being cut that you don’t want to be damaged. 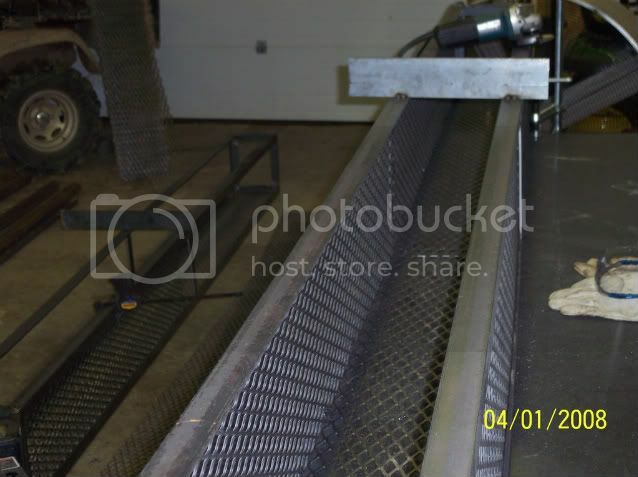 Chips will get in between the base plate and metal and trash the finish even on plastic covered metals. Formica is nice and slippery and the saw will glide. Formica makes a good "folding" straight edge too. You can roll it up a 120 inch long 6 inch wide strip and tape it into a 2 foot loop. If you want to use it as a saw guide you need to add a thin strip of alauminioum angle to your saw base plate and let the Formica ride over the foot and run on the vertical leg. Two threaded holes to mount the angle is all you need. One strip under the saw, one as a guide and roll them both up together when done. Last edited by Vicegrip; 04-03-2008, 05:45 AM. All times are GMT-6. This page was generated at 03:02 AM.